Property owners in the Abbotsford area are often faced with seasonal complications, but maintaining an inviting space is easier than ever with our Gorillas nearby. The highly skilled Gorilla team is always growing, and with Utesh as their fearless leader, Abbotsford is looking better than ever. The look and functionality of your property is important. First impressions aren’t everything but they can set the tone for your visitors and clients. Unappealing features of your home can come in many forms and can start from the ground up. You might notice organic debris or clutter scattered around your roof, but getting it down can be tough and dangerous. With the right safety equipment and tools, great results for your roof cleaning and moss removal or gutter cleaning, have never been easier! The winter season can also pose health and safety hazards to your property. Buried sidewalks or walkways or slippery surfaces can lead to slips, falls or even trips to the hospital. These unnecessary risks are a thing of the past with a little help from our Gorillas. Whether you are looking for structural security or curb appeal, Utesh and his team have got you covered! Each Gorilla can help scrub and shine your property with our Abbotsford graffiti removal, Abbotsford window cleaning and pressure washing services. Typical gorillas don’t exactly have a dress code, but your friendly neighbourhood Gorilla specialists do. 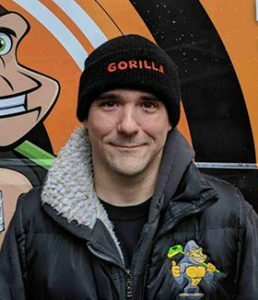 You might catch a glimpse of a brightly coloured uniform traveling the streets of Mission, Maple Ridge and Pitt Meadows, but never fear, that is just the Gorilla team. Homes and businesses throughout these areas are up against a lot, so why not let us lend a helping paw? Greyson and his team of property maintenance experts are available to care for your residential and commercial properties. Taking care of a property is a top-to-bottom job. Some of these areas are easier to reach than others, but that does not make them any simpler to care for. Even chores as seemingly simple as wiping down windows can be problematic without the right experience. When you choose a Gorilla for your property maintenance needs, you can rest easy knowing that every area is treated properly, with the right tools for the job. Choosing a Gorilla means difficult to reach areas like your roof can be clutter-free, moss-free and draining smoothly. In addition to basic, routine practices, the Gorilla team is able to keep up with seasonal issues as well. Snow clearing and salting is a major strain on property owners, but it doesn’t need to be. With shovels, blowers and plows, there is no property that our team cannot create a clear and inviting outdoor area. Whether it is rain, shine or sub-zero temperatures, Greyson and his Gorillas have got you covered. Why Should You Go Gorilla? Choosing Gorilla Property Services for your home or workplace is all Pro and no Con. Our maintenance experts are local to your area and are involved members of our communities. You will never have to sit and wait for the service that you need. With prompt service, competitive prices and expert customer service, there is no better option for your space. All it takes for a smooth-running property is one phone call to Greyson and his team of property specialists. Gorillas are not a native species for Vancouver but you can expect to see more and more of them roaming the streets. You don’t have to worry though, these Gorillas are trained, uniformed and led by Pascal, a friendly, neighbourhood franchise partner. Pascal and his crack team of maintenance experts are ready and available to have your home or commercial space clean and welcoming in no time. Looks play a major part in property values, and foot traffic. The wrong look can make or break your business day, and dissuade visitors or clients from coming inside. Instead of letting a splash of graffiti dictate your day, call a Gorilla for your Vancouver graffiti removal. In addition to peeling paint off of decks or walls, our Gorillas are available to help ditch natural staining as well. A proper Vancouver pressure washing can make a world of difference to your decks, patios, and concrete but no job is done properly without the right technique. Even something as simple as cleaning windows can be problematic without the right tools! Seasonal changes can be a pest, but not with the help of a Gorilla. Our team of specialists can clean up in winter and throughout the rest of the year as well. Vancouver snow clearing and salting helps keep you on your feet. If you feel safest with your feet on the ground, call a Gorilla for your Vancouver roof cleaning and moss removal, as well as your Vancouver gutter cleaning. Finding the right property maintenance team can be tough. You want to know that the unique needs of your home or commercial property are being met. Luckily for East Vancouver residents, all it takes is one phone call for Eli and his team to be on the scene. Whether your property is in need of routine or cosmetic services, a Gorilla is always nearby. Gorillas are great climbers, but that does not mean that we leave safety equipment out of the equation. Without the proper tools and training, something as seemingly simple as an East Vancouver roof cleaning and moss removal can lead to extreme health hazards. The same goes for your gutter cleaning. Don’t take a chance on your well-being, or your property when you can call up a Gorilla instead. Dirty windows might be an eye-sore but, over time, sitting material can cause structural damage. Glass, much like concrete, is a porous material and that is why it is important to practice routine maintenance for your window cleaning and pressure washing. While some services are routine over periods of time, others are reactionary to pains that come with vandalism. Our East Vancouver graffiti removal tackles all the tough spots of stripping paint from the exterior areas of your property. Whether you want to ditch unwanted paint or unexpected snow fall, Eli and his team have got your covered! If you live in the West Vancouver area, you might have noticed a group of brightly uniformed property specialists, cruising your neighbourhood, don’t worry, those are just Gorillas! As our team grows, you will be seeing more our of Gorillas, swinging into action around your property, led by franchisee partner, Vincent. The Gorilla team is always working hard to keep communities clean by treating obvious stains like graffiti, seasonal wear and tear or unwanted growth. Vancouver might be known for its thriving art scene but that does not mean that you want your property turned into an impromptu canvas. If this has been the case for your home or business, all it takes is one call to Vincent and his team to have your property looking great again in no time. Our brand of Gorilla services approach the problem areas of your property at every level. For those hard to reach areas such as your roof, Vincent will see to your West Vancouver roof cleaning and moss removal. Hitting heights can be tough on the best of days, but doing so with a task in mind can be even worse. Your West Vancouver gutter cleaning is a chore that must be done but that doesn’t make it any simpler to get there! For all those tricky tasks, just call a Gorilla! With Vincent and his team behind you, your property can be looking its best in no time. Our wide range of services covers the look of outdoor construction materials as well as helping to get the full lifespan out of your roof, concrete and windows. Demand for proper property maintenance in the Richmond area is always growing. Property owners all over the Richmond community are searching for reliable service and expert results. If you are one of these seekers, all you have to do is pick up the phone and call Pascal! With property service experts like Pascal and his Gorillas, you can eliminate the west coast worries of staining and unnecessary wear and tear to your property. Issues around your property can range from the obvious to the easily missed. Basic routine practices like window cleaning, gutter cleaning or Richmond roof cleaning and moss removal are tough but necessary. In addition to keeping these areas of your home running smoothly, Pascal and his Gorillas can handle aesthetics as well. Graffiti doesn’t stand a chance against a Gorilla, but our specialists can remove natural staining as well. Richmond pressure washing and graffiti removal are all just a part of our repertoire. While we are getting rid of things around your home or business, you might as well let us haul away all of that unwanted snow! North Vancouver is widely known as one of the most desirable neighbourhoods for B.C residents and it takes a lot of hard work to keep it that way! Maintaining the look and curb appeal of your home or business can be tough, but you don’t have to stress with Al and his team of Gorillas behind you! There are plenty of reasons to call Al and his team of highly-trained Gorillas. A bit of routine maintenance and semi-annual services like roof cleaning and moss removal or North Vancouver gutter cleaning, goes a long way. Keeping your property in great condition takes daily maintenance but larger and seasonal jobs are required as well. For example, you might not consider how much a pain snow removal can be, until you are half buried! More obvious property issues, like vandalism are easier to spot, so it is no wonder that graffiti removal is one of our most popular call-outs. Staining, whether organic or man-made can be treated on glass, with out North Vancouver window cleaning or on harder surfaces with our pressure washing services. Professional property maintenance can make a world of difference to the condition and lifespan of your property, so let us help maintain your investment! The city of Vernon has a lot to offer. With beautiful scenery, wineries and a never-ending tourism industry, keeping communities welcoming is more important than ever. Luckily for property owners, the Gorilla team is expanding and local franchisee partner, Troy is always ready to help out. If you are debating whether or not professional property maintenance is right for you, consider how a basic routine can help improve the look and condition of your property. No matter how hard you try, there is no way to prevent staining. Ugly marks or unwanted growth seems to just happen, but they do not need to be a permanent staple of your home or workplace. Unwanted growth or materials can soak into porous materials and lead to weakening of windows or even concrete. Instead of dealing with unnecessary replacements, call Troy for your Vernon window cleaning and pressure washing. The longer that staining is allowed to sit, the worse it becomes. This is true of natural stains and man-made ones like graffiti. The need for prompt service is what motivates our Gorillas to strive for same day service of our Vernon graffiti removal. While issues with the street-level of your property might be obvious, higher areas are harder to get to. Roofs are often ignored just because treating them is inconvenient, but this doesn’t have to be the case with a Gorilla around! If your roof is collecting debris or growing moss, call Troy for our Vernon roof cleaning and moss removal or gutter cleaning. Keeping your property clean and functioning is a tall order and can seem impossible. It doesn’t need to be though, with Gorillas roaming through your community. As the demand for complete and reliable service grows, so does the Gorilla family. Gorilla franchisee partner Jordan is leading his very own team of local experts, keeping properties in the Langley area clean and inviting. Graffiti artists might like to leave their mark but they are not discerning about where. You might be dealing with an unwanted paint job splashed across your property, but it doesn’t have to be for long! Jordan and his team of Gorillas strive for same-day removal of graffiti, whenever it is possible. In addition to removing graffiti, our Gorillas can remove natural staining from exterior areas and windows, as well. Our Langley window cleaning and pressure washing are all necessary for keeping your property looking its best throughout the year. Natural debris happens through the course of the year as well. Roof clutter, gutter blockages and snow fall are all a part of living in Langley. Instead of being feeling stuck or buried in your property, call Jordan for your Langley roof cleaning and moss removal, gutter cleaning and snow removal and salting.